Although it comes from the Oriental area, green tea is a pleasure to drink all over the world. He became a popular beverage, due to his numerous healing effects on the body. Some use it for the purpose of slimming; some use it for detoxification of the organism, due to its known antioxidant role. Green tea (Camellia sinensis) is an herbaceous plant, from which leaves, green tea is prepared as a beverage. This plant is a woody structure and grows in the form of bush up to 9 meters in height. Green tea originates from China and India, from the oriental climate, where tea drinking is a whole ritual. It has been used since 1000 years ago, where it has been used as a stimulant to the nervous system, a diuretic (helping to eliminate excess fluid), and coagulant (it controls bleeding and helps healing wounds). What is fermented and what is an unfermented green tea? Parts used to prepare green tea are leaf, bud and tree. Green tea alone is not always green in color. Depending on the degree of oxidation in the leaf, when fresh leaves are subjected to the action of high temperatures, seven different types of tea are obtained. Among them the most used ones are green tea, black tea and oolong tea. The difference between them is in the color of the leaf and the content of the active substance. Green tea is made from non-oxidized leaves. It belongs to one of the less processed teas, which retains all the medicinal properties and contains a higher concentration of antioxidants and useful polyphenols, which are responsible for many benefits of green tea. Oolong tea is partially fermented, while black tea is completely fermented. With increasing fermentation in the leaf, the level of the preferred polyphenols decreases, and the level of caffeine increases. Oxidation of polyphenol reduces the quality of tea. Green tea is rich in polyphenols. They have antioxidant activity, destroy free radicals and thus protect the organism from harmful effects. In green tea, polyphenols are grouped into one group, called - catechins, made up of six compounds. They are even more potent than vitamin C and vitamin E in terms of antioxidant effect on cells. Among the catechins, one is especially distinguished, EGCG (Epigallocatechin gallate), which is most active in its group. Green tea also contains alkaloids - caffeine, theophylline, and theobromine. Their role is to stimulating the nervous system and cardiovascular system. They raise alertness, mood and blood pressure. Amino acid in green tea, known as L-Theanine, has a soothing effect on the nervous system, and is also called as amino acid for sleep and relaxation. What is green tea good for? Many people use it and drink it instead of coffee, or use it in the form of capsules or as a component for preparing cosmetics for care. • Heart and blood vessels - antioxidants and other green tea substances can significantly protect the heart and blood vessels. It improves circulation, reduces cholesterol. In the case of elderly people suffering from low pressure that occurs immediately after meals, it improves circulation and raises the level of circulating blood. By cleansing the blood vessels from precipitated lipids and cholesterol, green tea belongs to a group of potential medicinal substances in order to prevent coronary artery disease. People who have regular and balanced blood pressure will not experience changes in blood pressure when consuming green tea. Two to three cups of green tea per day are enough to reduce the risk of cardiovascular disease of any cause. • Brain and nervous system - green tea contains 2-4% of caffeine. This enhances mental activity, working ability and thinking. The role of caffeine in the brain is such, that it blocks the neurotransmitter-adenosine. Adenosine is by its nature an inhibitor and a caffeine stimulant. This achieves a better neurological response at the level of the sterile cells, and increases the concentration of stimulating neurotransmitters - dopamine and norepinephrine, which exhibit a positive effect of green tea in the form of alertness and better concentration. Although green tea contains less caffeine than coffee, this concentration is quite sufficient to produce a positive effect. The positive effect of green tea also comes from the amino acid of L-theane, which together with caffeine, improves mental abilities. Green tea in the fight against cancer - studies that study the effects of green tea on cancer are mixed. Anticancerogenic properties of green tea are possible, but they are not completely reliable. There are indications that green tea can affects cancer cells, but research is still at an early stage. Green tea antioxidants are thought to be responsible for killing tumor cells, and protecting healthy cells. Women in China and other Asian countries, where green tea is traditionally used, rarely suffer from cervical tumors, breast tumors, and ovarian tumors. This can also be cited as a reduction in the risk of cancer, but not a reliable claim. What is well-known is that green tea has no effect on colon cancer. • Lowers cholesterol - green tea due to the high content of polyphenols, it lowers HDL and increases in "good" LDL cholesterol in the blood. Consuming 3g green tea daily within 24 weeks can reduce the level of bad cholesterol to a minimum. 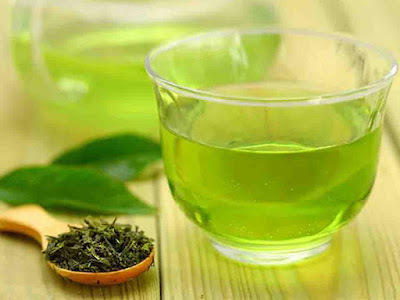 • Green Tea and Weight Loss - Consuming green tea can reduce body weight in obese people. However, this fact can be taken with a dose, because the result is individual, and it depends on the person to the person. A study conducted on a group of 10 healthy men has proven an increase in energy consumption by 4%. The second, however, showed an oxidation of fat by 17% due to the consumption of green tea. This can be said that green tea has a selective effect on weight loss. The action of green tea active substances is directed to the degradation of fat cells from fat stores, from the hips, stomachs and their circulation, where they will be consumed as energy fuel during exercise. Green tea itself cannot be decisive in weight loss, but it contributes to the acceleration of metabolism and the consequent loss of fatty deposits. • Green tea and increased growth hormone production - this information may be interesting to athletes or bodybuilders. Studies have shown a link between green tea and growth hormone, in the capacity of increased growth hormone production by 321%, after consuming green tea at a specific time. Growth hormone is one of the most important lipolytic hormones in the body. It allows the burning of fat, increased muscle mass and total energy. It also has an impact on the bone - muscle system as a reparation and regeneration of collagen. It is known as the "anti-aging hormone" because it slows down the aging process. • Green Tea and Acne - Consuming green tea or its external application as a coating, can reduce acne for a period of 8 weeks. • Prostate function - Men who drink more green tea have a lower risk of getting prostate cancer. In the meantime, the use is preventive, because in people who already have prostate cancer, its role is insignificant. • Strengthens the immune system - polyphenols and flavonoids in green tea, strengthen the immune system, they act antiviral, especially in colds and flu. • Parkinson's disease and Crohn's disease - can be prevented by daily consumption of green tea. • Removes an island under your eyes - do not throw green tea bags, but put them on as covers on tired eyes. Depression will decrease and headache will disappear. Applying green tea in moderate amounts is desirable and will not cause adverse effects. Consuming green tea is safe for adults, while the use in children is uncertain, even undesirable, due to the content of caffeine in green tea. Excessive consumption is considered to be taking five cups a day. There may be present nervousness, headache, nausea, vomiting, rapid heart rate, arrhythmia, heartburn, dizziness, and convulsions. It is estimated that the lethal dose of caffeine in green tea is 10-14 grams. 1. Pregnancy and breast-feeding - in pregnant women and women who are breastfeeding, green tea can be drunk, at most 2 cups a day. Because of the caffeine it contains is not desirable because it can negatively affect the fetus. 2. Anemia - green tea and anemia do not go together. Green tea exacerbates an already present anemia, which is why malnourished people should be able to get rid of it. 3. Diabetes - green tea caffeine can affect blood glucose regulation. Thus, diabetics, carefully with this tea, always measure the level of glucose after using green tea. 4. High blood pressure - people with high blood pressure may have problems consuming green tea due to the presence of caffeine. This is again individually, from person to person, because in some cases, people were satisfied with the application of green tea in case of hypertension. 5. Anxiety - green tea can increase this condition due to the stimulus it contains. 6. Diarrhea - in the case of diarrhea, green tea should not be consumed, because in larger quantities it worsens the condition. 7. Glaucoma - the consumption of green tea increases eye pressure. 8. Liver - it is thought that green tea should not be used by people with damaged liver, as it may exacerbate the already existing condition. 9. Osteoporosis - Due to caffeine, it is necessary to limit the intake of green tea to 2-3 cups per day. • Stimulants of the nervous system (amphetamine, cocaine, ephedrine) - act stimulating to the nervous system, as much as the green tea caffeine. Due to the combination of these drugs and green tea, conditions such as nervousness, rapid heart rate, ears in the ears, low blood pressure, and hypertension can occur. Avoid taking these medicines together with green tea. • Adenosine - used in medicine for the examination of cardiovascular and cardiovascular disease. Green tea caffeine blocks the action of adenosine, so it is desirable that these two substances should not be combined at least 24 hours before testing. • Beta-blockers (propranolol) - green tea can increase blood pressure in people taking beta blockers. These are medicines for the treatment of high blood pressure. • Antibiotics - green tea can increase the effects of beta-lactam antibiotics, making bacteria less resistant. • Benzodiazepines - green tea can reduce the sedative effect of these drugs. • Lithium - for the treatment of bipolar disorder should not be used together with green tea, as it inhibits the effect of the drug. • Hepatotoxic drugs - not with green tea! • Nicotine and Alcohol - together with green tea have excessive stimulatory effect on CNS and heart. • Drugs for diabetes - can be partially inhibited in combination with green tea. • Chemotherapy - green tea increases the efficacy of these drugs, although only in laboratory conditions. Clinically not yet proven. • Thiamine (Vitamin B1) - green tea reduces the absorption of this vitamin. When preparing green tea, it is necessary to know that it does suffer from a high temperature of water. * Water should not be rolled. (80 - 85 degrees). This is the moment of occurrence of bubbles in the water. Then take off the water from the fire. * Take 1 - 1 1/5 teaspoons of green tea (powder) on 1 cup of hot water. * It is necessary to warm up the bowl in which to put the tea. * Put the powder in the kettle / cup and spill over with hot water. * Ideal stand-up time is 3 minutes, after which tea should be processed. * After 3 minutes, the color should be brown, and the taste must not be bitter. * The tea must always be freshly prepared. * Green tea and lemon are a good combination, along with a little honey. * If you want real quality, try to find green tea in Chinese stores. They use it most as a beverage; it is always fresh and safe for good quality. In addition, the Chinese prepare green tea in special teapots, made of baked clay, which gives a special flavor and quality to green tea. * Various types of green tea, brings variable green tea effects because of the quality of green tea.